Image: One of th enumerous caves in Cheddar Gorge. Cheddar Gorge is one of the most famed beauty spots in the British Isles. Here the road winds between sheer cliffs up to 450 feet high, and at times is so narrow, that even two cars have difficulty in passing. Because of the steepness and narrowness of the gorge and the subsequent congestion which occurs in summer months, coaches are not permitted to travel up the gorge between noon and 6.00 p.m. Perhaps the best way to approach Cheddar Gorge is from the north, which brings you down the B3371, through the gorge, past the famous caves and into the village. There are two theories as to how the gorge was formed. The first is that it was a huge cave which has fallen in. However, this theory has lost favour and a modern, less dramatic hypothesis has been put forward, that it was formed by a huge river at the time of the ice ages. A remnant of this river now runs underground, and reappears just below the entrance to Gough's Cave. The visitor to Cheddar Gorge will see many caves dotted about the cliffs, but these are for the most part small and uninteresting. There are, however, three main caves of note, and these have been opened to the public. Named after Mr George Cox, this cave was discovered during a quarrying operation in 1837. 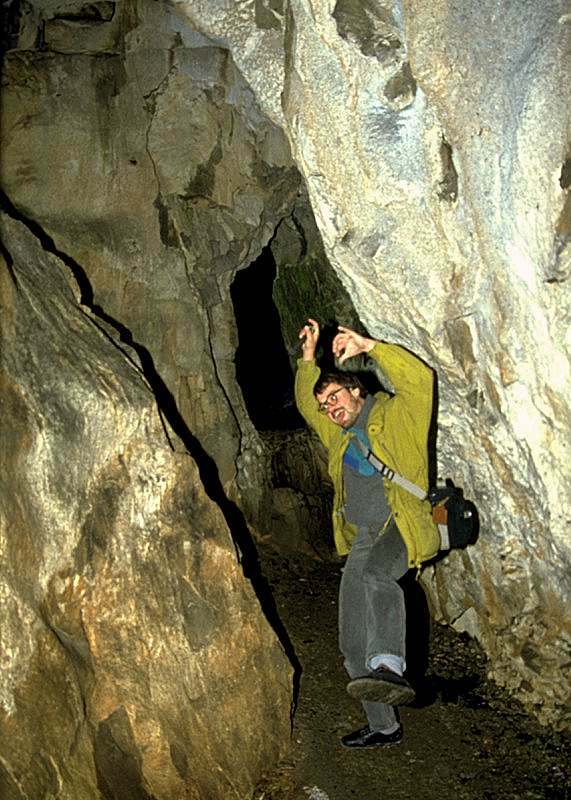 Having put his pick through a small hole Mr Cox enlarged it, and entered the cave, which he subsequently opened to the public. It consists basically of seven small but beautiful grottoes, joined by low archways. The formations are extremely well preserved, and the names given to them are most realistic, as for instance the String of Poultry. Perhaps the most intriguing section of the cave is that known as the Home of the Rainbow, for here, traces of minerals have been brought in from the surface, and have given the stalagmite a wide range of colour, from nearly black, green, and orange to pure white. The famous French speleologist, E.A. Martel, visited this cave and declared that "out of 600 caves, Cox's was admired the most". Note: this cave is also adjacent to Jacob's Ladder, which is topped by an observatory containing a camera obscura, giving wide panoramic views over 30 miles of countryside. This is the most visited cave in Great Britain. It has become exceedingly commercialised and is very popular. Travelling up the gorge, one comes across the skeleton of a cave man holding up a restaurant sign, and behind him, the entrance to the cave. The caves were discovered in 1893 by Mr R. C. Gough, who, together with his sons, had been trying hard to find a cave to rival Cox's Cave. After a series of defeats they finally broke into a fossil river gallery, and one of the first sights to meet them was the Fonts, a series of stalagmite gours or dams, rising up tens of feet into the hill, tier upon tier of stalagmite which had been built up over the centuries. The Fonts today are still as clean and sparkling as when the Goughs first discovered them. Great use has been made of the reflecting power of water in this cave, and one of the more famous sights is that of the Swiss Village. Here, stalactites on the roof, reflected in a pool below, give the appearance of a Swiss village, perched high on a mountain top. The cave is generally high, with tall avens, and wide, spacious passages. The show section ends in two large chambers, Aladdin's Cave, a solid wall of stalagmite drapery stretching high up into the roof and covered with a thin film of water so that it glistens and sparkles in the electric lights, and Solomon's Temple. Here the lights are extinguished, and a most dramatic effect is made by the guide who slowly turns them on again, gradually lighting up a huge chamber 20 feet wide and 60 feet high. Outside the cave is a small museum containing the bones and relics found in the cave. This includes a "cave man skeleton" thought to be 12,000 years old, with many flint implements, and axe-heads etc., found in Gough's and other caves in the gorge. Geologically speaking this is part of the Cox's Cave system, and, indeed, a rift in this cave once connected with Cox's Cave. The highlight of this cave, as the name suggests, is the waterfall, which, though artificial, gives a good indication of the way in which a cave of this nature is formed.